All odds seemed against them - four key players were missing before the trip and they lost four more during the series - but Australia showed admirable spirit and skill to clinch the series with a game to spare. On a slightly damp pitch in Guwahati, Mitchell Johnson found his mojo and combined with Doug Bollinger to bundle out India for 170 before Shane Watson gave a solid start to the chase to ensure Australia cantered to a series win. Bollinger was at the top of his game today on a track conducive to his style and found his mark immediately, nipping out two wickets early and snapping twin dangerous partnerships later en route to 5 for 35. Johnson - back in the side after missing the last game - scythed through the top order to leave India, who chose to bat, tottering at 27 for 5 before Ravindra Jadeja featured in two fighting partnerships. First was a slow repairing job with MS Dhoni, then a violent one with Praveen Kumar to raise hopes of a revival, but Bollinger returned to remove both batsmen to ensure that Australia wouldn't have too many to chase. Were the conditions so English that the ball was swinging wildly? No. Was the pitch aiding alarming movement? No. There was just a bit of movement, in the air and off the pitch, and Australia exploited it superbly to bundle India out. Johnson, whose inability to swing the ball into the right-handers had blunted his threat in the recent times, found that inswing today and immediately looked a different bowler. With a slightly round-armish action which helped him to tilt the ball back in, Johnson gnawed away at the batsmen at disconcerting pace. The start wasn't flattering - his second delivery was whiplashed for six over point by Virender Sehwag - but Johnson bounced back in the same over to start the demolition job. It was a full delivery, Sehwag shaped for his big drive but the ball curved in to thread the gap and splayed the stumps. Egged on, Johnson went from strength to strength and unfurled his full repertoire: rapid pace, extra bounce, a slinging round-arm, and consistent line and length. He removed Gautam Gambhir with a delivery on middle and off, to which the batsman shaped to work it to the on side as if he expected it to angle in to his pads. But, to his horror, the ball straightened to hit off stump. Johnson went on to trouble Yuvraj Singh in the corridor before he dismissed Suresh Raina after harassing him with his bounce. The set-up was obvious - bowl a few short balls and push him back before slipping in that fatal full delivery - but Raina fell for it again. Perhaps the ball stopped on him a bit, but he was late in getting forward to a full delivery and ended up flicking it straight to short mid-on. 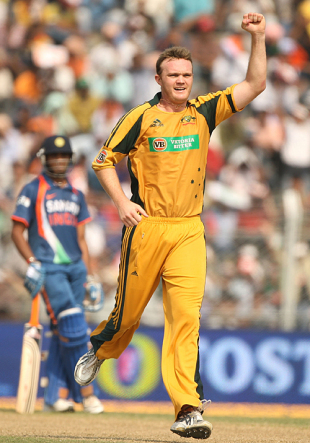 If Johnson created an opening with his incisive bowling, Bollinger ensured India didn't come back into the game with consistent seam bowling. There is nothing flashy about Bollinger and you know what you will get from him: a steady line and length, changes in pace, and an ability to bowl to his fields. Today it was enough to get him the big wickets of Sachin Tendulkar, Yuvraj and Dhoni. He induced Tendulkar into pushing one straight back to him and bowled Yuvraj with a slightly freaky dismissal. The ball ricocheted off Yuvraj's pad over his right shoulder and as Yuvraj, clueless about where the ball went, turned behind to place the bat back inside the crease he pushed it back to the stumps. Then he returned for a second spell and got Dhoni and Harbhajan in one over, before terminating Jadeja's resistance with the first ball of a third spell. Dhoni, who was fortunate to survive a caught-behind decision against Bollinger when he was 0, was given out lbw to the same bowler to a delivery that was missing off stump. The final margin would have been far bigger as India were wobbling at 75 for 7 but Jadeja and Praveen, who caned Clint McKay for 28 runs with several audacious hits over mid-off and mid-on, played the best knocks of their respective careers to increase the target. Ultimately, however, they could only save India from total embarrassment. The chase could have been tricky on a pitch that was increasingly aiding turn but Watson stole the show with positive batting. He stretched forward to the spinners, ensured he kept his pads away from the line and played several skillful shots. There were two fours in particular that stood out, both against Jadeja. They were arm-balls, fizzing towards the top of off, and Watson brought his bat down at the last minute to crunch them past first slip. Harbhajan created a minor scare by removing both Watson and Ricky Ponting in quick succession but in the absence of a big target and with India possessing only one quality spinner, Mike Hussey and Cameron White slowly but surely pushed Australia to a worthy series win.